Hazardous Chemicals: Local Responders Need to Know! 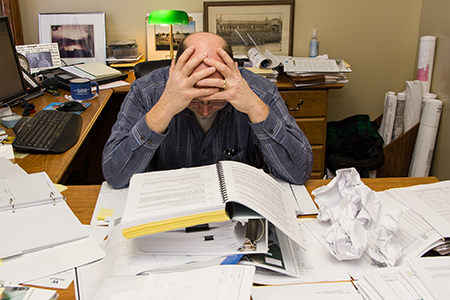 Mountains of paperwork, deadlines looming, hazardous chemical concerns…Are you feeling the stress at your water and wastewater treatment facilities because of regulatory requirements? As an environmental scientist, I have spent over a decade complying with environmental regulations in the industrial field. Since I am interacting more with municipalities in a consulting capacity, my focus has shifted to investigating how the main industrial regulations apply to municipal facilities, specifically the Emergency Planning and Community Right-to-Know Act (EPCRA), also referred to as Community Right to Know (CRTK). The big eye-opener for this requirement was the 1984 gas leak from a pesticide plant in Bhopal, India that exposed over 500,000 people to toxic substances and killed over 15,000. The U.S. government decided there needed to be a way for local emergency responders to have access to chemical information at facilities and be able to plan for emergency response actions. As a result, the EPCRA requirements were passed as part of the Superfund Amendments and Reauthorization Act (SARA) of 1986 to mitigate concerns regarding environmental and safety hazards posed by the storage and handling of hazardous chemicals. What does this mean for you? Yep, more reporting! However, the required reporting is more efficient since the Indiana Department of Environmental Management (IDEM) implemented the Regulatory Service Portal for online reporting and stopped accepting paper copies in 2011. First, it is required by law. Second, by notifying the local emergency response agencies of the chemicals you have on-site, they can better prepare their response activities in the event of an emergency. The information below describes the EPCRA sections and briefly explains their purpose. Chemicals deemed an EHS are extremely dangerous and require notification to the local fire departments and other response agencies of their existence at a facility. If you have an EHS on site above the Threshold Planning Quantity (TPQ), you are required to report it within 30 days of it arriving on site. A complete list of the EHSs can be found in Appendix A of 40 CFR 355; however, we will look at a few of the more common chemicals in water and wastewater facilities. If a facility spills or leaks a chemical off-site above the Reportable Quantity (RQ), they are required to notify the Indiana Emergency Response Commission (IERC) and the Local Emergency Planning Committee (LEPC) immediately. 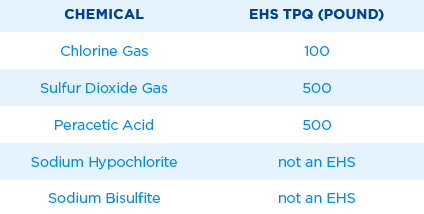 If you have a hazardous chemical in an amount exceeding the TPQ for an EHS or 10,000 pounds for other chemicals, you must submit a 311 and 312 Report. These reports have to be submitted to the IERC, LEPC and the local fire departments by March 1 annually. 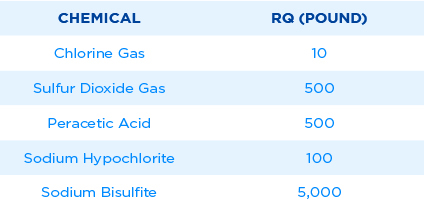 If you store more than chemical volumes listed below, it is likely you should be reporting. For other hazardous chemicals for which facilities are required to have or prepare a Material Safety Data Sheet (MSDS) or Safety Data Sheet (SDS), the minimum reporting threshold is 10,000 pounds. I have spent more time completing this report (and pulling out my hair over it) than any other requirement or regulation. The TRI requires manufacturing facilities to determine how chemicals are released or transferred to the environment. This is, of course, an oversimplified explanation of the TRI. This report only applies to facilities with SIC codes 2011 through 3999, and water treatment plants (4941 SIC code) and wastewater treatment plants (4952 SIC code) are not applicable. The TRI regulations do not apply to you. Hurray! Something you don't have to do. If you have an EHS or other bulk chemicals at your facility, you should evaluate the amount you have on-site to determine if the quantity is above the thresholds that require notification to local agencies. Remember, these reports are used as a tool for emergency responders when responding to a fire, explosion or chemical release. We all play a role in protecting our environment and keeping our communities safe. Do you think you may have to complete these reports, but are unsure where to start? For a better understanding on how to complete the EPCRA reports, refer to the download for additional information and helpful hints. More information can be found on the following web pages: IDEM’s CRTK, USEPA’s EPCRA or EPA's EPCRA.